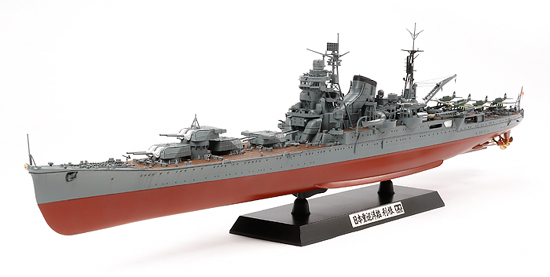 TAMIYA 78024 JAPANESE HEAVY CRUISER TONE (1/350)! • 1/350 scale plastic assembly model kit of the Japanese Heavy Cruiser Tone. • You can choose to build either a waterline or a full-hull display model. • Kit includes reinforcing frame parts and screws to enable accurate assembly for both waterline and full-hull models. • Display stands for the highly detailed aircraft models are included to allow you to create a flying diorama. • The bridge windows and searchlight lenses are depicted with transparent parts. • The masts and radio posts are made with reinforced ABS resin.-Features metal-plated screw shafts and metal parts for anchor and chain. • Machine gun parts feature a laser processing for a sharper, more realistic finish. • Parts are included to depict main gun barrels at different elevation levels. Polycaps enable switching of gun turrets as well as free turret rotation for a variety of displays.